Alexandria Bay Steamboat Company, Alexandria Bay, NY. 1889, May 16 Rebuilt at Cape Vincent, NY. 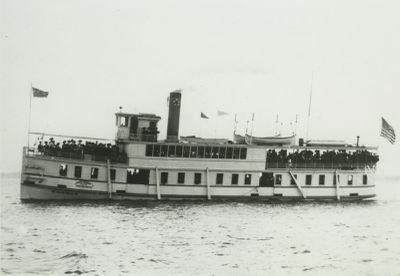 1894, Jul 28 Rebuilt at Cape Vincent; renamed ISLAND BELLE. 1897, Jul 26 Owned Folgers. 1910, Apr 22 Rebuilt at Cape Vincent. 1913, Mar Sunk in Alexandria Bay, NY; raised. 1915, May 19 Rebuilt, Cape Vincent. 1930, Nov 20 Burned, Buffalo, NY.